THE TEERITZ AGENDA: Fri 27/2/15 - I Love Oscar, Assignment No.1 Down, New Screen Door, & This Week's Wristwatches. Fri 27/2/15 - I Love Oscar, Assignment No.1 Down, New Screen Door, & This Week's Wristwatches. It was Oscar Night. I stayed away from Twitter and all news websites to avoid any spoilers. It's always tricky trying to pick the winners when you haven't seen all the nominees, but sometimes, you can base a hunch on everything but the movie itself. I mentioned last week that I thought the Best Actress Oscar would go to either Rosamund Pike or Julianne Moore. Pike gave an extraordinary performance in Gone Girl, but I thought that Moore has always been gifted in every role she's ever done, so I was glad to see her get the award for her role in Still Alice. Of course, I think she should have won it for her role in Far From Heaven back in 2003. Anyway, I could go on and on. Perhaps next year, I'll try to catch all of the nominated films prior to the awards. Of course, I spent a bit of time trying to get a better look at his wristwatch, since this is what Bond/watch nerds like myself tend to do. 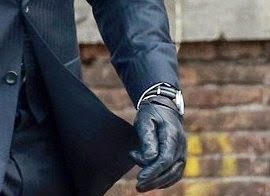 I narrowed it down to something on a NATO strap, and I suspected that it would be a sports watch, most probably either a Planet Ocean (like the one he wore in Skyfall) or the newer Seamaster 300 Master Co-Axial model that was released last year. Then, earlier this week, we got some shots of filming that was taking place in Rome. Naturally, fashion police the world over tore this look to shreds, but it did give a better glimpse of his wristwatch. Sort of. Some said he looked like a chauffeur, others said he looked like a mafioso going to a funeral. Many stated that he looked very un-Bondian, but none of this was keeping me awake at night. The close-up, above, shows a NATO strap. 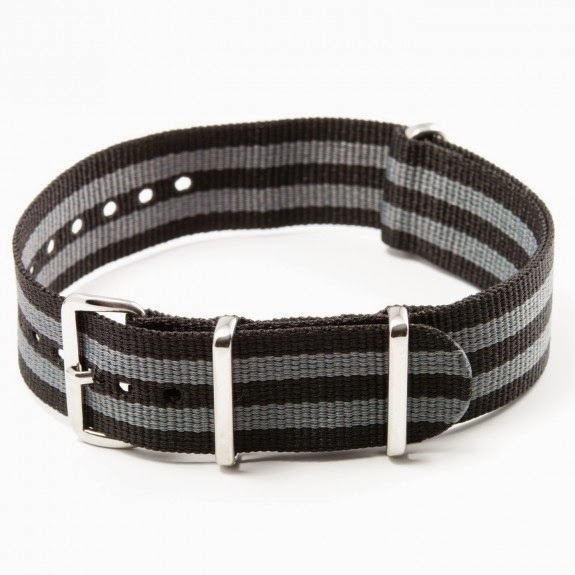 Omega have brought out their own range of these nylon straps, but you won't see me rushing out to get one. Not at their prices. I think these straps retail for around...actually, I'm not sure. They're either about $150 or $325. Ridiculous when you can get a nice NATO strap for fifteen bucks. This is a better shot of the watch. 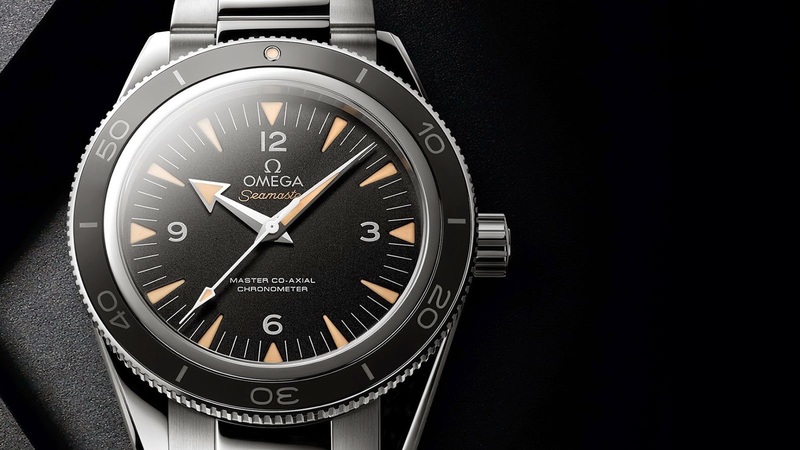 Looks like the Seamaster 300 Master Co-Axial it is. Here's the fun part, though. Back in the days of VHS, if you'd sat down to watch Goldfinger, you would see Bond look at his watch in the pre-credits sequence and perhaps notice that his watch-strap consisted of a black and grey striping. GQ magazine ran a competition years ago where they had some of these straps made up as a giveaway. Since the advent of DVD, and especially BluRay, which offered a more hi-def view of the strap's true colouring, this strap has been changed to something considered closer to the original strap worn by Connery back in 1964. Many strap manufacturers got on board and began coming up with what have been referred to as TrueBond regimental straps. I've bought more than my fare share of these over the years and they are very comfortable to wear, depending on what watch you put them on. I've tried them on my Omega Planet Ocean Seamaster, but found them to feel a little too flimsy compared to the thickness of the watch. However, on my WatchCo Seamaster 300 or Rolex Submariner, these straps are perfect. Both of these watches are light enough to provide a comfy fit and feel. The new screen door finally arrived. The installer fitted it in under an hour. I'm still not happy with the overall experience and I filled in the customer feedback form to let them know about it, too. They wanted feedback, they got it. Continued with a little more of the assignment and got it finished. Fourteen pages. Geez! Fiddled with watches and took the steel mesh bracelet off the Seamaster 300 and put a TrueBond NATO on it. Close as I'll get to Bond's current wristwatch, which is fine by me. I got a copy of Angelmaker in hardback off eBay for six bucks. Somebody told me about this book recently and I thought it sounded intriguing. Should be an interesting read. Now all I have to do is finish The Other Typist which is moving along nicely, but the print is a little small, so I'm not tending to read more than about six or seven pages a night. I'll get through it sooner or later, I guess. Assignment finished and submitted. That's one down. As this course of study is coming to an end, it's now time to really ramp up the job hunting. I went through my job search notes and discarded a bunch of old applications and other stuff that is no longer relevant. For the record, I will never apply for work at a department store ever again. My last two applications last year were never replied to. Probably a good thing, when I think about it, considering that I'm looking for work in the library industry anyway. Therefore, I drafted an e-mail earlier today to send to my local council, regarding library work. I haven't sent the e-mail yet. I think I'll re-read it later today before sending it off. Might need to tweak it a little here and there. Aside from that, another week done. The sun's out, and I should probably have some lunch. Need to go buy some coffee. We're running low. Anyway, I'll leave you with one last pic showing my pair of Tom Ford sunglasses in tortoise-shell, which appear to be the same design that Bond wears in the pictures up above. My wife got me these sunnies about a year ago. 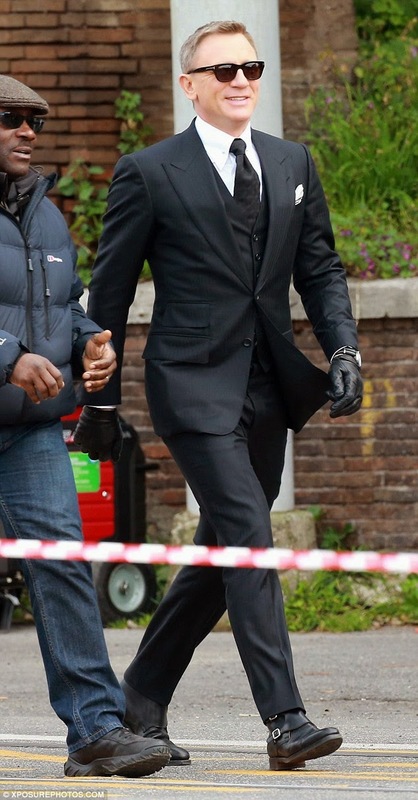 It's nice when Bond copies me for a change. It's only happened twice in my life. Hey... you know, I kinda really like that black and grey band. I'm not sure what watch I would want that on, but I think... think... I just might have to track that look down. Wish someone would show an Oscar Night highlights show, minus the ads and minus the acceptance speeches. 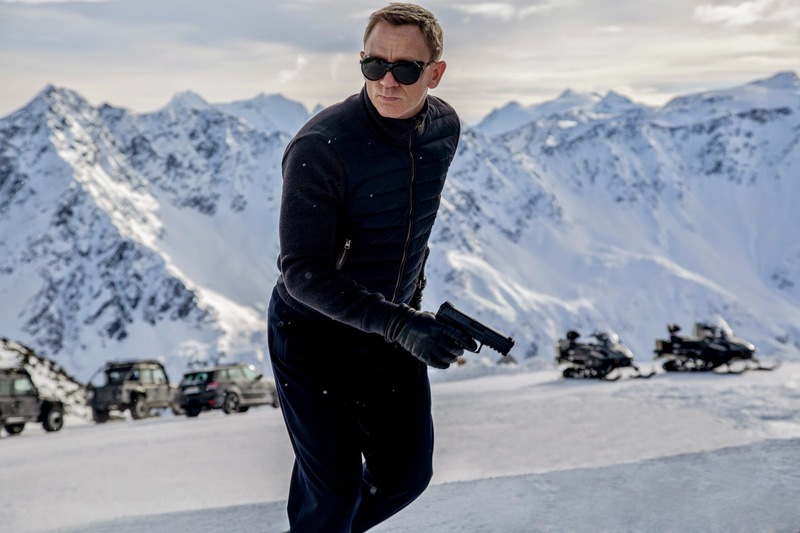 Interesting stuff about the Bond watches - a nice healthy obsession! @ Scott, check out www.cheapestnatostraps.com. Best range, and best prices. 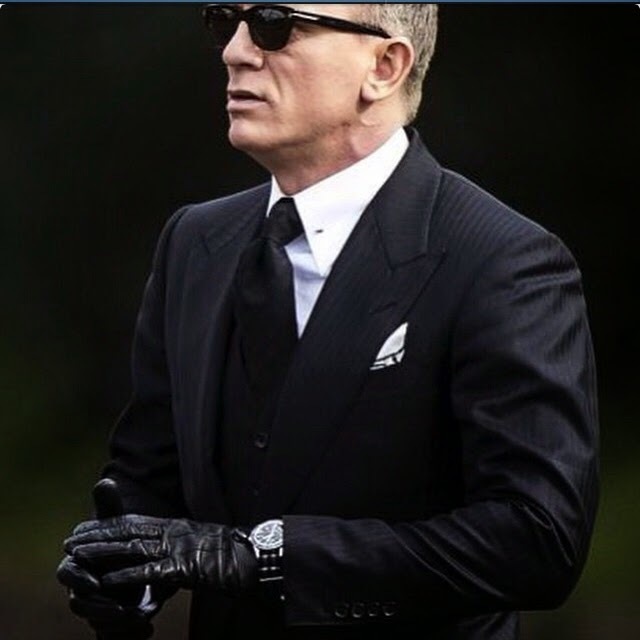 That black and grey strap is ideally suited for a watch with a black dial, generally a dive watch or military watch. @ writelephant, the acceptance speeches are the best part. Some of the writers and directors are quite eloquent with what they say. As for the watch obsession, there's nothing healthy about it!